Incontinence in men is rare. Urge incontinence can result from a number of factors including an enlarged prostate, bladder inflammation, infection, stones, neurological conditions, etc. The majority of the time, urge incontinence can be successfully treated with treatment of the underlying condition or oral medications. Stress incontinence in men is usually the result of previous pelvic surgery. Although it is uncommon, it can be very aggravating when it does occur. The majority of stress incontinence occurs after prostatectomy as a result of damage to the external urinary sphincter. Treatments for post-prostatectomy stress incontinence have undergone major advancements in the last several years. Here at Urological Surgical Associates we offer all forms of male anti-incontinence procedures. Periurethral Bulking Agents . This is a 5-10 minute procedure done under light anesthesia. Through a telescopic camera, a bulking agent, such as collagen, is injected into the tissue around the urethra to cause urethral compression and reduce the degree of urinary incontinence. Unfortunately, the collagen dissolves away over time and repeat injections may be required every 6-12 months. This procedure is indicated for the treatment of mild to moderate stress incontinence. Male Slings. Currently there are two types of slings available for male stress incontinence, InvanceTM and AdvanceTM male sling systems. The first is a sling that anchors to the bones in your pelvis and compresses the urethra closed. The second is a thin strip of material that forms a hammock under the urethra and repositions the urethra to closed position. Depending on the degree of your incontinence and previous history of other procedures our physicians will determine which sling is right for you. These slings are excellent choices for patients with moderate stress incontinence. 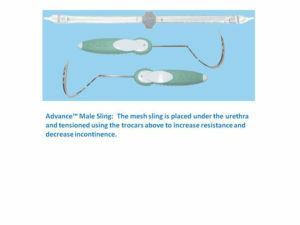 The newer AdvanceTM male sling is also being increasingly used in men with severe stress incontinence with promising results. The InVanceTM Male Sling System is an innovative, safe and effective surgical solution for mild to moderate stress urinary incontinence in men resulting from prostatectomy. A “sling” made of synthetic mesh is placed completely inside your body. The sling is securely attached to bones in your pelvis. It places pressure on the urethra, reducing the possibility of urine leakage and providing simple, discreet urinary control. There is nothing for you to manipulate or operate—it works on its own. Most patients are continent immediately following the procedure and can resume normal, non-strenuous activities within a few days. It is performed as outpatient surgery, under spinal or general anesthesia. The surgery takes under an hour and there is a single small incision under the scrotum. Majority of patients are sent home without a catheter. The AdVanceTM male sling system is a newer procedure that offers slightly better urinary control rates than the InvanceTM male sling in the properly chosen patient. It also has fewer side effects. A thin “sling” made of synthetic mesh is placed inside the body through small incisions. The sling supports and repositions the urethra, restoring normal bladder control. Most patients are continent immediately following the procedure and can resume normal, non-strenuous activities shortly thereafter. It is performed as outpatient surgery, under spinal or general anesthesia. The surgery takes under an hour and there is a single small incision under the scrotum. Majority of patients are sent home without a catheter. Artificial Urinary Sphincter . This is the best option for treatment for men with severe urinary incontinence. This device has been available for almost 35 years and provides excellent, reliable results. Majority of patients who undergo this procedure are extremely satisfied with the results. 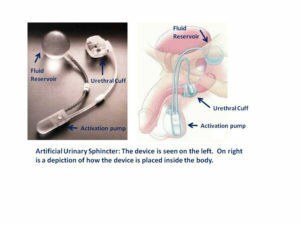 The device is placed completely inside your body to provide simple, discreet urinary control. Urination is controlled by squeezing and releasing a pump, located in the scrotum.